Disposing of medical waste in your home is one of the most difficult things to manage. When you need to dispose of syringes and lancets or other related medical waste in your home, there’s certain precautions you need to take to ensure that you’re not introducing a medical hazard and that you’re protecting your family, sanitation workers, and anyone else that might encounter it. It’s important to remember to avoid flushing medical waste down the toilet. This increases the risk of accidental exposure for sanitation and sewage treatment workers, janitors, and your family. Schedule a service for ongoing pickup of household medical waste weekly, monthly, or quarterly. A mail back system is a safe, secure option to dispose of your personal medical waste properly. Each system includes all the components required to package your medical waste to be disposed of at a secure facility. Some mail-back medical waste disposal systems may be available at your local pharmacy or through your health care provider. Several products can destroy sharps and make them safer by melting the needle and syringe into a harmless plastic “puck,” or destroying the needle to render it harmless. 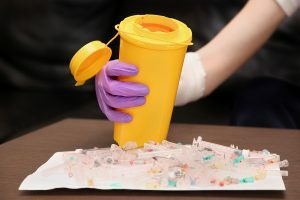 This isn’t a recommended method due to the risk of infectious disease, but it can be employed if you have the need for a long-term disposal solution for your home. No matter which service you choose, Medical Waste Pros can help you find the system that works best for your sharps and hazardous medical waste disposal. Get a free quote today! Don’t just throw your medical waste in the trash. Medical Waste Pros can help you find a reliable local medical waste disposal expert to provide a container to help you dispose of your household waste safely and securely. To get started, fill out the form to the right, or give us a call at (888) 755-6370. Within minutes, we’ll get you free, no obligation quotes within minutes!